So sad I missed the Butlins event...you got to play with Ludo!! I don't know much about the Butlins event but love the dinos. Looks like someone's had too much champagne already. hehe looks like one of the dinos has had a touch too much already! Is that how the dinosaurs became extinct? 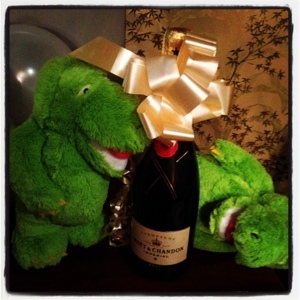 Looks like the dinosaur on the right has already hit the bottle. great picture. Awesome! Ludo is a party animal! Soft toys drinking? Now I have seen it all!